Click image to enlarge Port Westward, Oregon. View from levee road along Bradbury Slough. Image taken August 27, 2012. At the western end of the Bradbury Slough and across from the downstream tip of Crims Island, at approximately Columbia River Mile (RM) 53, lies the Oregon development of Port Westward. Upstream is Clatskanie and the small community of Mayger while downstream is the community of Westport. Port Westward is located on the tip of the Clatskanie River/Beaver Slough delta, a place Lewis and Clark called "Fanny's Bottom", after Captain Clark's younger sister. In the early 1800s, the area of Port Westward was known as "Oak Point". On March 26, 1806, the Lewis and Clark expedition passed through this area and Captain Lewis entered a comment in his journal about the oak trees on the tip of "Fannys Bottom". On June 1, 1810, Nathan Winship, William Smith, and others of the Winship expedition on the ship Albatross came upon this (???) grove of oak trees on the south bank of the Columbia River, and named the locality "Oak Point". In 1841, Charles Wilkes of the U.S. Exploring Expedition charted this Oregon "Oak Point" on his maps. However, a few years after Wilkes, George Abernethy established a mill on the Washington side of the Columbia River and used the name "Oak Point". Oak Point has remained on the Washington side of the Columbia River ever since. Lewis and Clark called the Port Westward area "Fanny's Bottom" and during the first half of the 1800s, the area became known as "Oak Point". During World War II, Port Westward was the location of the Beaver Ammunition Depot, a major army shipping point for the Pacific Theater of operations. In 1970, the site was sold to the Kaiser-Aetna interests, who began to develop a trans-shipping complex. It later was the site of the Portland General Electric Company's Beaver Generating Plant. 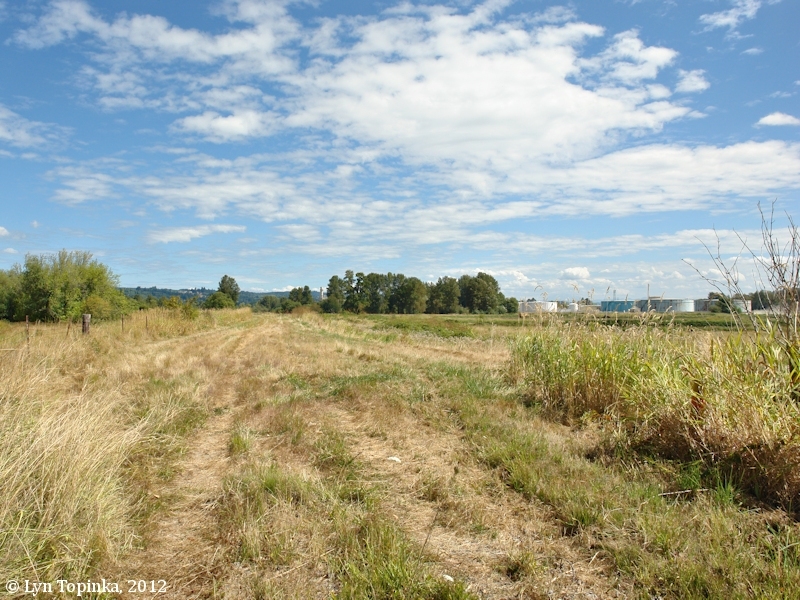 Click image to enlarge Clatskanie floodplain and the Bradbury Slough, looking towards Port Westward, Oregon. Image taken August 27, 2012. Click image to enlarge Port Westward, Oregon, once known as "Oak Point", looking across to today's Oak Point, Washington. View from the southeast, at the gate on the levee road on Bradbury Slough. Image taken August 27, 2012. Click image to enlarge Port Westward, Oregon, as seen from the southwest. View from the gate on Erickson Dike Road. Image taken August 28, 2012. 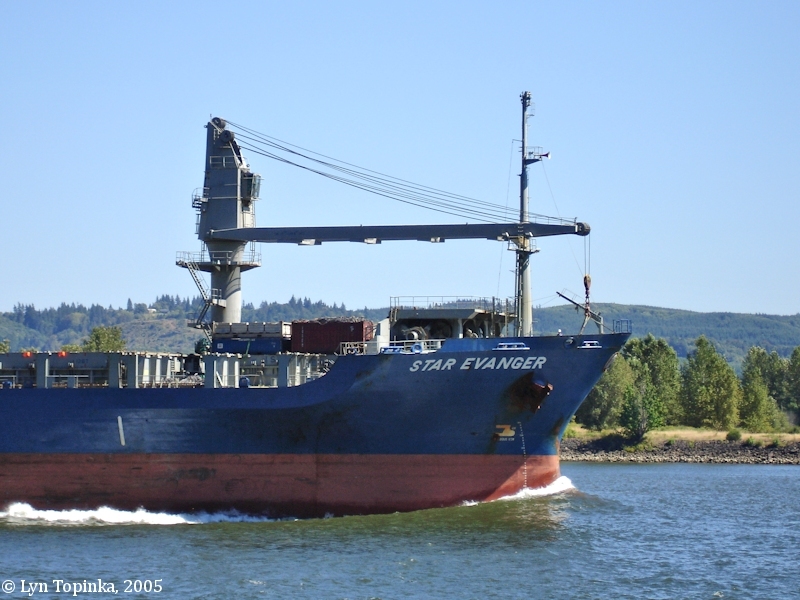 Click image to enlarge Cargo Container Star Evanger reaching Port Westward, Oregon. View from Washington State Highway 4 at Oak Point. Image taken July 28, 2005. 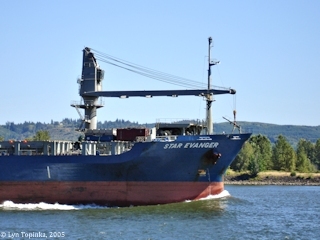 Click image to enlarge Cargo Container Star Evanger passing Port Westward, Oregon. View from Washington State Highway 4 at Oak Point. Image taken July 28, 2005. "The original Port Westward was purchased from the federal government in the mid-1960s after it had served as the Beaver Army ammunity depot, from which hundreds of thousands of tons of high explosives were brought in by rail – the same rail line that runs through Columbia County today – and shipped to the Pacific Theatre during World War II and also the Korean War. In February of 1942 – two months into World War II – the federal government forced the Clatskanie area farmers who made their living on that property to sell it to the Army. Since the Port district purchased it back almost 50 years ago, we’ve been trying to create jobs on that property for local citizens and tax valuation to support the local schools, law enforcement, fire department and ambulance service, the library district, park and recreation, county services, 4-H and extension service, and more." Source: The Clatskanie Chief, August 1, 2012. 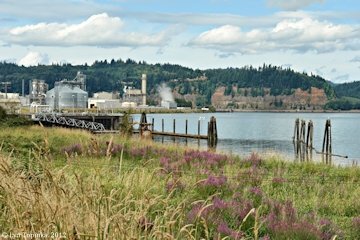 "The Port Westward Energy Park includes more than 900 acres of land located conveniently alongside the Columbia River near Clatskanie. Owned by the Port of St. Helens since 1966, the property was once home to some of the finest dairy herds in the state. In early 1942, within a few months of the Japanese attack on Pearl Harbor, the federal government realized the usefulness of the natural deep draft port on the Columbia River and the adjacent land and acquired the land for use in the war effort. That decision would forever link the property to World War II. They named it the Beaver Ammunition Storage Point. This base became a major shipping point for arms and ammunition heading to the Pacific Theatre. Families who lived on the property were forced to vacate their homes and sacrifice their land to the war effort. According to newspaper reports from The Clatskanie Chief, about a dozen local families were forced to relocate. Four years after the frantic effort to build the Beaver Ammunition Storage Point, the base was deactivated at the close of WWII, and later reactivated during the Korean War. The property was eventually phased out as a military installation. In 1966, the Port of St. Helens purchased the property ... A California based industrial development corporation called Westward Properties, Inc., leased the majority of the Port Westward acreage in 1967. After changing hands several times over the next few years and seeing several projects including an Aluminum plant be announced only to quietly disappear months or years later, that lease was subsequently conveyed to Portland General Electric in 1973. 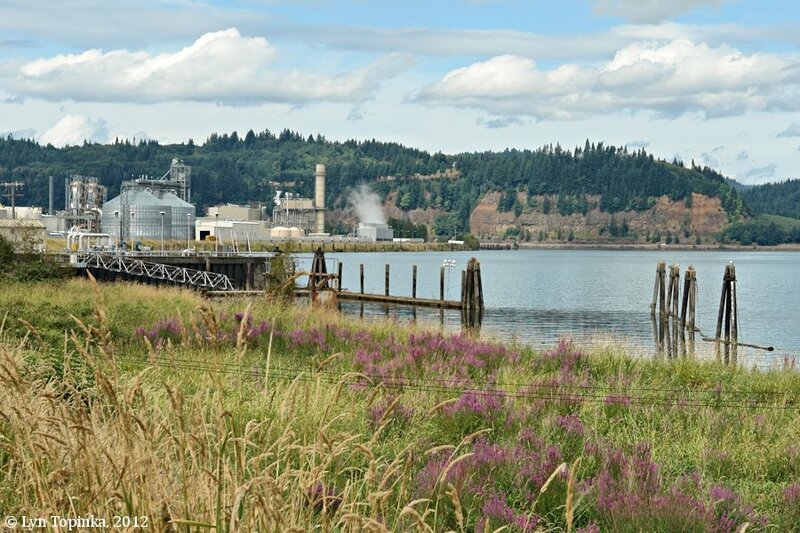 PGE completed construction of its Beaver Generating Plant in 1975, which included a natural gas/oil fired power plant, high voltage transmission lines, large riverside shipping dock and one of the largest oil tank farms on the west coast. 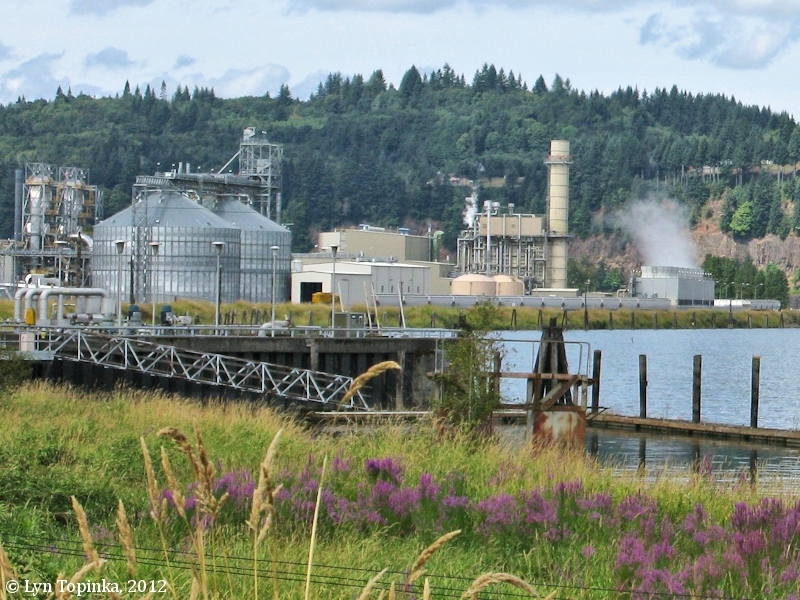 PGE still operates this plant today ..."
Click image to enlarge Pier at Port Westward, Oregon. View from Washington State Highway 4 at Oak Point. The long pier was built during World War II and contained railroad tracks. Image taken July 28, 2005.